Gendered and sexualized abuse and other forms of violence are visibly present in the culture of the third millennium. Especially bodies that are gendered as female are – both dead and alive – objects of multiple forms of abuse and violence in the texts and imageries of contemporary culture. Men, on the other hand, are often represented as abusive towards women and as the violent gender or, as targets of other men’s violence. Structural violence has also an impact on many areas of everyday life, and it is materialized in, for example discrimination and inequality. Gender and Violence: The Ethics and Politics of Reading scrutinizes gendered violence as a complex phenomenon of contemporary culture. The authors study the ways in which ways representations of violence can be read, viewed and received. They also discuss what kind of politics the violent representations implement and actualize, and how they affect their audience. Gender and Violence takes a critical stance on the intersections of gender, power, and violence in literature, film, television and the internet. The analysis focuses on, for example, sci-fi, Nordic Noir and North American comedy series, poems, young adult literature (YA) and nationalist blog texts. 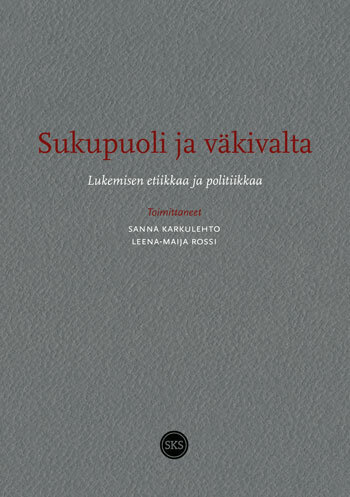 The book presents both Finnish and international academic discussions, in which researchers in the fields of gender studies, arts and literature, and cultural studies challenge contemporary English abstract 279 understanding of gender, sexuality, power, and violence. Moreover, Gender and Violence provides tools for critical discussions on violence and in-depth scrutiny about its cost on all of us. Gender and Violence is an anthology of academic research articles. It works well as an academic textbook, but it also provides timely and new knowledge for everyone interested in questions of gender and violence – phenomena that touch upon all of us.